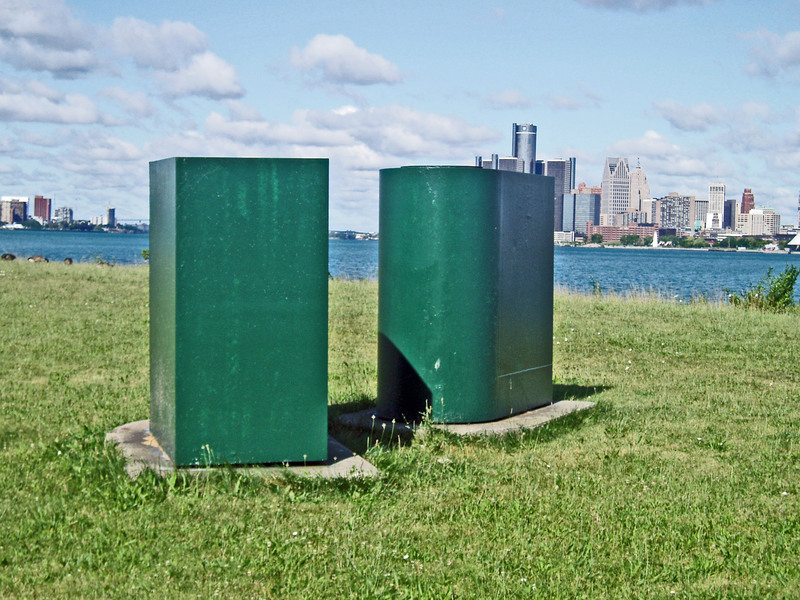 The most desirable location for a sculpture in the city of Detroit is the western end of Belle Isle. Looking south, you see Windsor. Looking toward the West, you see the Ambassador Bridge and get then a breath-grabbing view of Detroit’s marvelous skyline. No other city in the country has such an impressive skyline facing a friendly foreign nation. And just behind you is the Scott Fountain, among the most beautiful fountains in North America. At this spectacular spot, you find what I think is an undistinguished sculpture called “Untitled.” This is composed of two steel rectangles boxes with one side rounded. Frankly, they look, to me, quite like boxes that a utility might put above ground so that steam could be vented or to provide workers with entry to underground tunnels. They were originally painted gray which probably made they look even more like utility cabinets than they do now. At least, they are presently painted green. Perhaps I am too much of a Philistine and do not appreciate this kind of art. This work provokes thought, but not appreciation. Stanley Dolega studied at Michigan State and Wayne State. He apparently identified his works as capitalizing upon the industries and industrial heritage of Detroit. In his book, Art in Public Places (Detroit, Wayne State University Press, 1999), Dennis Alan Nawrocki reports that Stanley Dolega described this work as a composite of his experiences in Detroit. Dolega moved from Detroit to Wyoming, and by 2009, was a sculptor in Laramie. Dolega has another piece, also a welded steel sculpture with the name Untitled on display on the Wayne State University campus. Substance: Steel now painted a dull green.